Sen. Kirsten Gillibrand (D., N.Y.) defended her decision to call on former Democratic colleague Al Franken to resign in 2017, saying in a new interview the decision helped Democrats win the 2018 midterms. 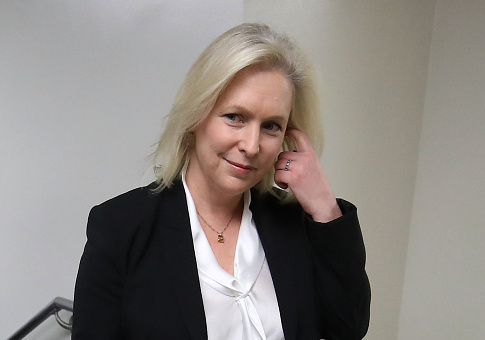 Gillibrand was the first Democrat to call on the Minnesota senator to resign following multiple accusations of sexual misconduct and groping. The rest of the caucus soon followed, and Franken, a popular figure among staunch liberals, reluctantly stepped aside. However, some Democrats quietly regretted they so quickly moved for Franken to resign without an investigation, and more than a dozen major Democratic bundlers and fundraisers told Politico last year they would not support Gillibrand because of her role in pushing Franken out. Ms. Gillibrand is also still navigating the fallout from another controversial choice within her own party: her decision in late 2017 to become the first Democratic senator to call for the resignation of Mr. Franken, following multiple allegations of sexual misconduct. Despite the backlash she has faced from some Democratic quarters, Ms. Gillibrand said she saved the party from itself, arguing that standing by Mr. Franken would have cost Democrats congressional seats in the midterms. And she said Senator Doug Jones, a Democrat, would not have won his special election in Alabama if Mr. Franken had not stepped aside and provided the party with a clear message against the Republican, Roy S. Moore, a state jurist accused of sexually assaulting teenage girls. She told the Atlantic last year she primarily called for Franken to resign because it was the right thing to do, citing her history of advocating for sexual assault victims. "I don’t think Democrats would have inspired millions of women to get out to vote. I don’t think Democratic women would have run as Democrats, or run across the country on issues they believe in," she said in December. "You either value women or you don’t. You either stand up for survivors or you don’t." Gillibrand added in the New York Times interview she woke up bawling the day after Donald Trump was elected. She has called on the president to resign over accusations of sexual misconduct against him, and she also made headlines when she said Bill Clinton should have stepped down over his affair with intern Monica Lewinsky, albeit decades after the fact. This entry was posted in Politics and tagged 2020 Election, Al Franken, Bill Clinton, Donald Trump, Kirsten Gillibrand, Sexual Assault, Sexual Harassment. Bookmark the permalink.